Product prices and availability are accurate as of 2019-04-20 12:05:29 EDT and are subject to change. Any price and availability information displayed on http://www.amazon.com/ at the time of purchase will apply to the purchase of this product. Go pro with LORAC pro palette 2. The sequel to our original, best-selling pro palette and created by celebrity makeup artist carol shaw, this pro artistry palette is packed with 8 shimmer and 8 matte eye shadows in all the cool shades you need to create the hottest looks straight from the red carpet. 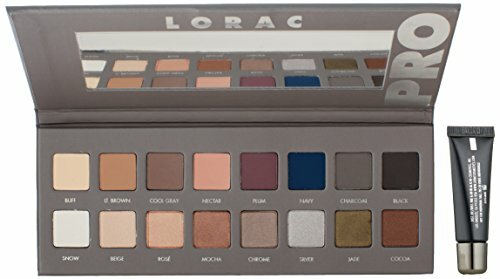 LORAC's velvety-smooth shadows are infused with soothing botanicals and are ultra-pigmented to perform wet or dry so you can shade, shadow, line and define your eyes, just like a pro. Pro palette 2 contains 16 eye shadows and a mini behind the scenes eye primer for stay-true color that lasts, a pro must-have. Top row: buff (matte), lt. Brown (matte), cool gray (matte), nectar (matte), plum (matte), navy (matte), charcoal (matte), black (matte). Bottom row: snow (shimmer), beige (shimmer), rosé (shimmer), mocha (shimmer), chrome (shimmer), silver (shimmer), jade (shimmer), cocoa (shimmer). Mini behind the scenes eye primer included. The lightweight eye primer is easy to smooth over the lids, fills in lines and prevents eye shadow from creasing.